Here’s a quick little snack I whipped up today to use up bagels and pita bread I (stupidly) bought before going out of town. 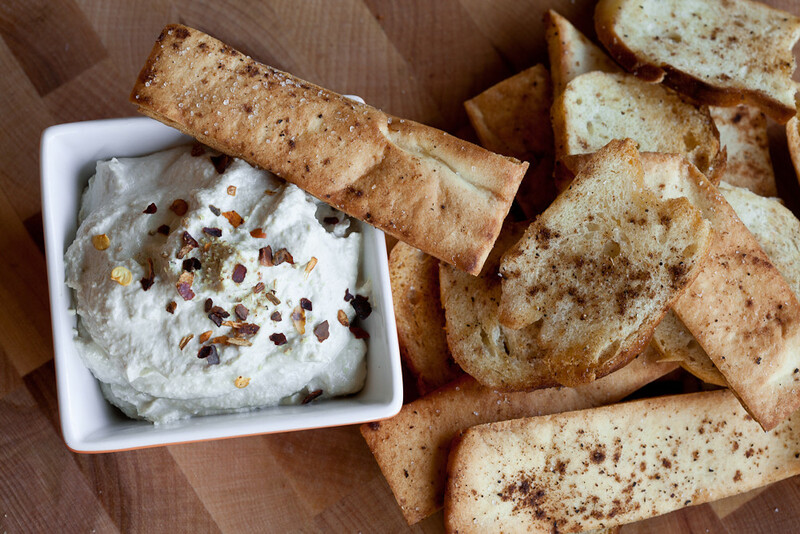 Bagel and pita chips are really easy to make, and you can spice them however you like. I also bought some roasted sunflower seeds, but had a hard time imagining how I could make it through 1 1/2 cups of them before they went bad. Clearly I’m not the most practical shopper. I used garam masala to flavor my chips, but you should treat any spices (and especially, any ground spice mixes you have) as fair game for this recipe. Smoked paprika? Old Bay? Japanese seven spice? Celery salt? So many possibilities. The sunflower dip has fresh lemon, ground white pepper, and a dash of tabasco. Here again is a lovely blank canvas for you to experiment with. If I had it available I would have added some freshly chopped mint. Roasted garlic or fresh scallions would make a lovely addition as well, for people who are normal and like those sorts of things (i.e. not me). The dip is really rich and reminds me a lot of tahini (sesame seed paste) but without the bitter taste. If you want an even more pronounced lemon flavor, add the zest. 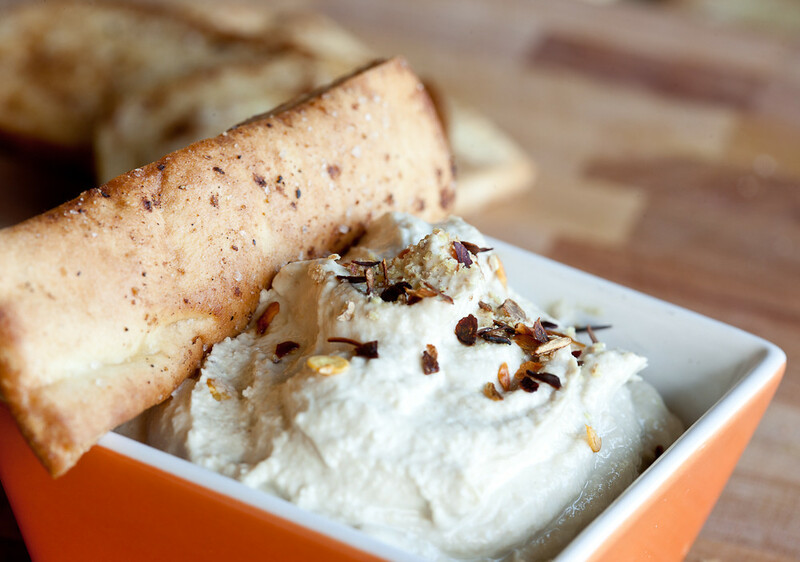 This dip can also be thinned out to form a dressing, used as a sandwich spread, or as stand in for hummus. 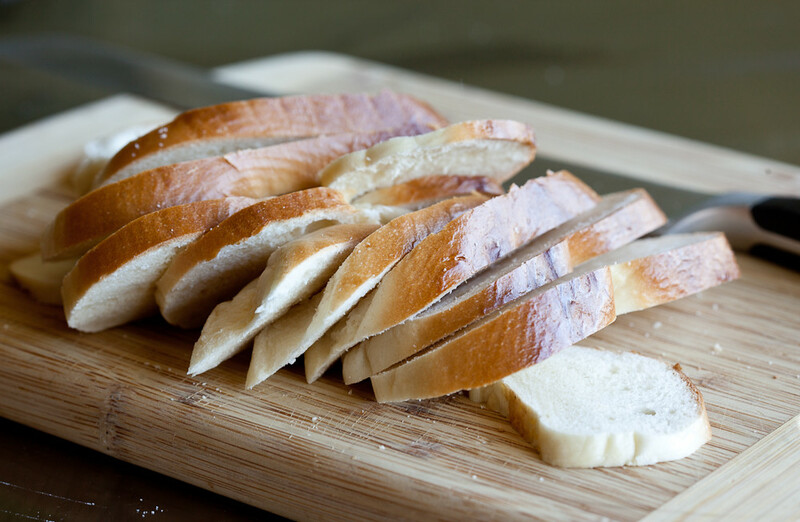 Slice your bagel into thin slices about 1/4 inch thick. Slice the pita bread rounds in half. Stack the halves and slice into 1 inch strips. 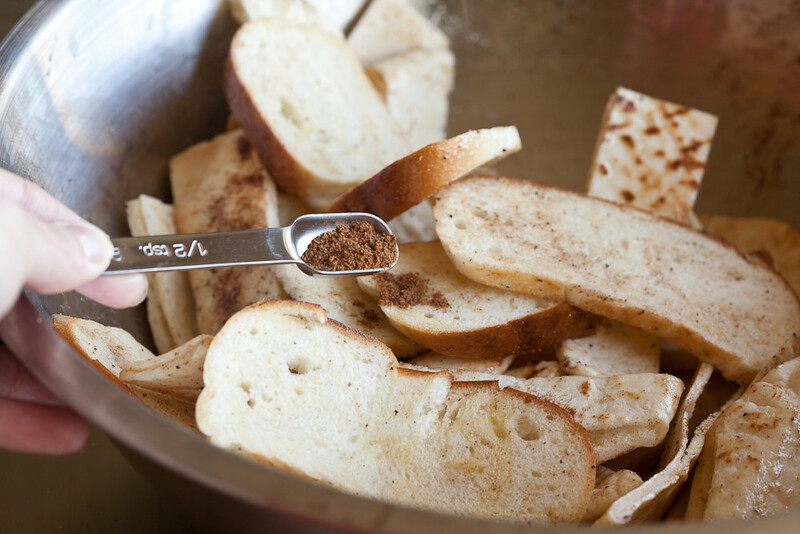 Place all the bread into a large bowl and toss well with 2 Tbs of olive oil and garam masala. 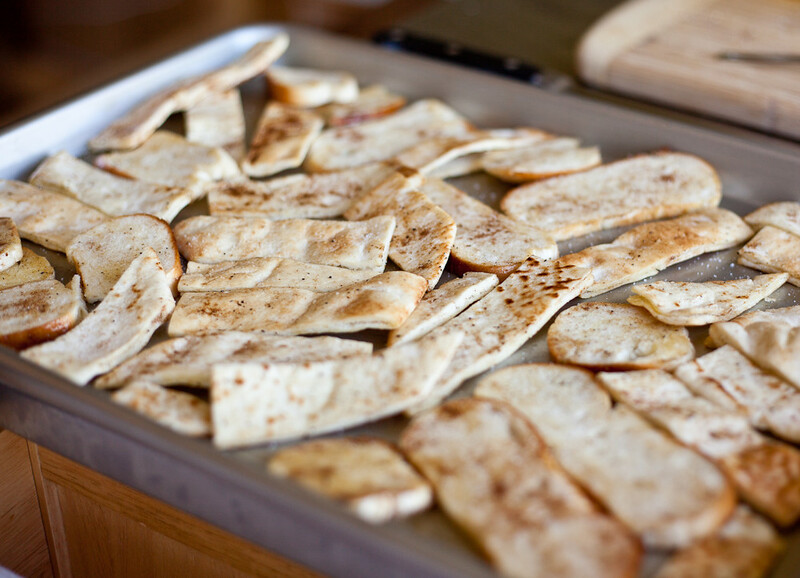 Arrange the chips in one layer on a baking sheet. Sprinkle with 2-3 pinches of salt. If needed, add a couple extra pinches of garam masala to any bits that need it. Bake at 350 degrees F for approximately 15 minutes. Set your timer for 10 minutes and start checking them for doneness at that point. The chips are done when they are beginning to crisp and turn a lightly golden brown. Be careful not to over-bake. Remove and let cool. 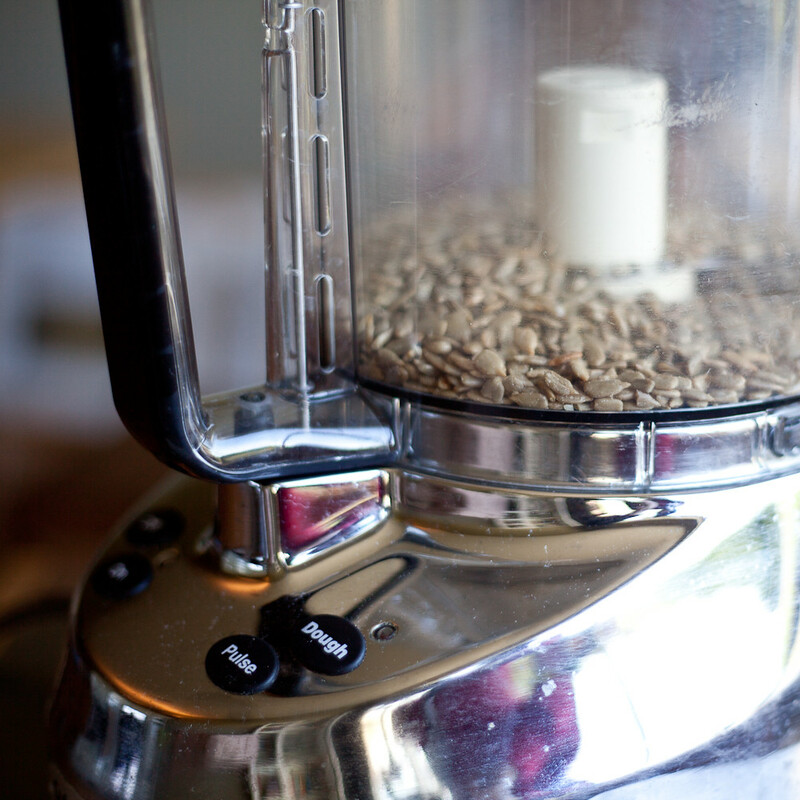 Add the sunflower meats to a food processor and turn it on. 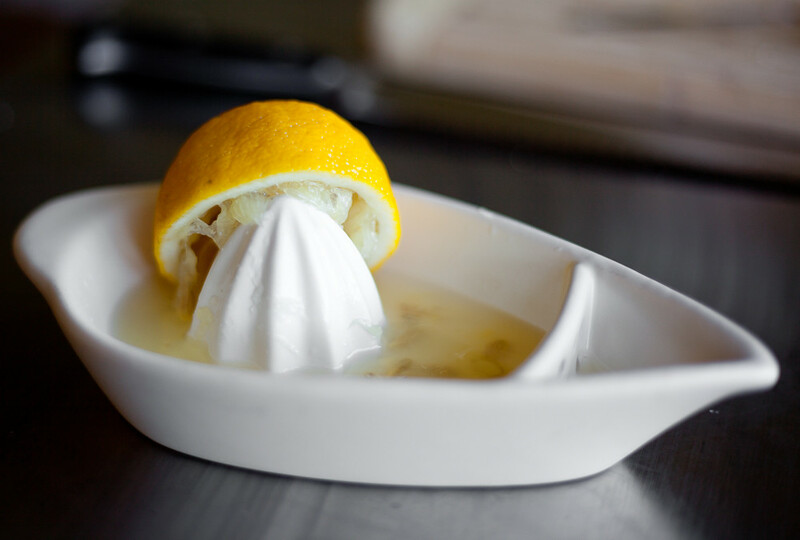 While running, add the oil and lemon juice and zest. 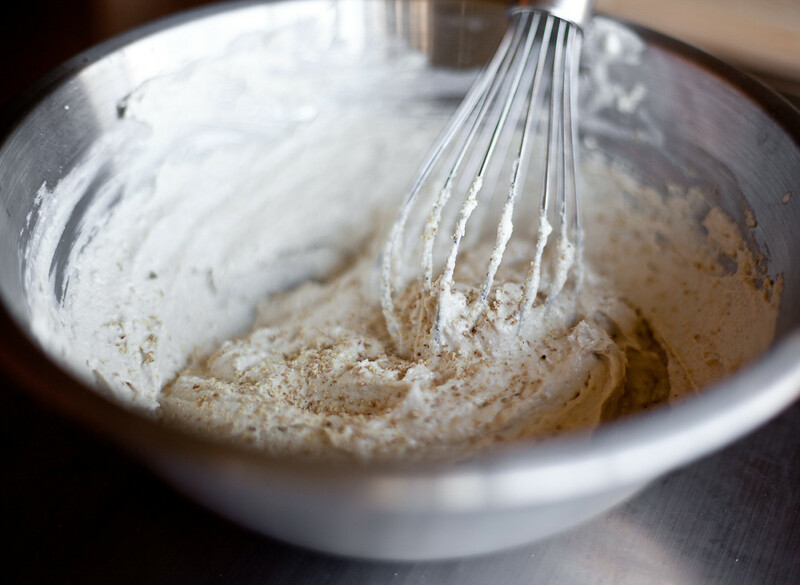 Slowly add in the water until a smooth, creamy dip is formed. Remove to a bowl and whisk in the salt, to taste, and the black pepper and tobasco. If needed, add more liquid to get the texture you like. Once the dip is ready, gently fold in any fresh chopped herbs you may be using. The recipe makes a rather mild dip that would be appropriate even for kids’ palates, so feel free to bump up the spices, tobasco, and lemon juice of you want something a bit zippier! yes please. I’m always impressed when people tell me they make their own crackers… but i guess it’s not too far from cookies and I am always making those. Now I know what to do about these left sunflower seeds I have in the pantry, thank you for this recipe! I am so glad you are back. Have been loving your cookbook going on now for 3 years. I have leftover sunflower seeds too! Can’t wait to try this. The flavors sound delicious, and I love the curried chips to dip it with. Thanks for the great idea! We almost always have sunflower seeds in the house.. But of course we just ran out. I’m going to have to run to the store to restock so I can make this. It looks devine! You must mean “shelled” sunflower seeds, as that is what you show in your picture. This sounds like a perfect use for day-old bagels. And I’m officially intrigued by that sunflower seed dip! I’m totally doing the Gluten-Free version of this. Thanks, AGAIN! wow! your recipes are wonderful! Sunflower seeds are perfect for dips, and a great stand in for those allergic to any nuts. i am happy to see you are back! That dip looks amazing and surprisingly light and fluffy. Definitely on my list to try soon. Thanks for sharing. Yay! You are posting again! I am so happy I’m actually a little teary-eyed. You’ve been back a month and I’ve only just found out! This makes me very happy. I’m often still browsing your old page and using your recipes. This spread looks super yummy and fab to use the often overlooked sunflower seed, a friend to us poor students :) Can’t wait to see more from you. So glad to see you’re back, I’m sure I speak for many others when I say you were missed. In the meantime I have thoroughly enjoyed your cookbook and have enjoyed giving multiple copies of it as a gift to more than a few friends. The most recent recipes all look so great, can’t wait to try them! I agree with your other posters, huge fan of your cookbook and super, duper happy you’re posting again, you have been missed :) I actually didn’t know you had a blog until some time after I had used several of your recipes from the cookbook. Very stoked for more recipes and food for thought about vegan cooking from you. Hooray! Can I make this dip in my vitamix as well? And if so do I have to soak the seeds or can I just throw ‘em in and go to town? Welcome back. Missed your site. Yum. YUM! So glad you’re back! Hi! We’re a couple of Italian vegan foodbloggers. We’ve just discovered your blog and your amazing recipes… Wow! Thanks a lot for sharing such good information :-). Your spread must be delicious. Yum!!! I’m SO GLAD you are back! You have been missed. You are inspiring me to get back to blogging again too. Can’t wait to keep up with your new posts. Yay!!! I am SO glad to see you back! I was planning dinner, checked into your site at work because I don’t have my cookbook with me and was so surprised to see your recent post that I also got a little teary-eyed. Your cookbook is the best! we keep it on the counter all the time, because it’s beautiful and because we use it pretty much everyday. All the best to you. Ooo, that sounds so good and creative, too!